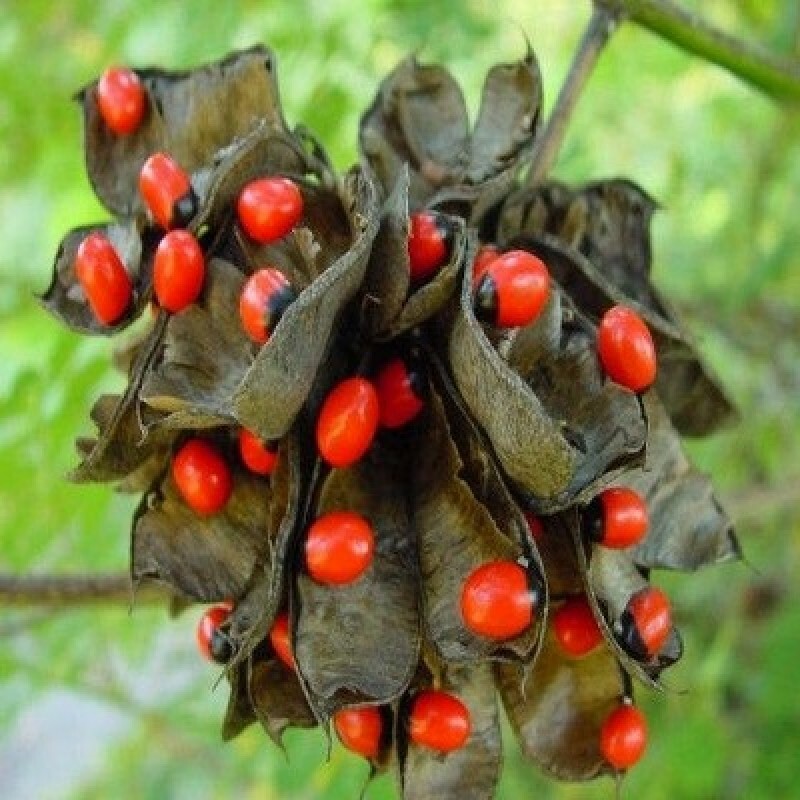 Abrus precatorius, known commonly as jequirity, Crab's eye, rosary pea, precatory pea or bean, John Crow Bead, Indian licorice, Akar Saga, gidee gidee or jumbie bead is a slender, perennial climber that twines around trees. It is a legume with long, pinnate-leafleted leaves.The plant is best known for its seeds, which are used as beads and in percussion instruments, and which are toxic due to the presence ofAbrin. The plant is native to India and grows in tropical and subtropical areas of the world where it has been introduced. It has a tendency to become weedy and invasive where it has been introduced. The seeds of Abrus precatorius are much valued in native jewelry for their bright coloration. Most beans are black and red, suggesting a ladybug, though other colors are available. Jewelry-making with jequirity seeds is dangerous, and there have been cases of death by a finger-prick while boring the seeds for beadwork. In Trinidad it is the brightly coloured seeds are strung into bracelets and worn around the wrist or ankle to ward offjumbies or evil spirits and "mal-yeux" - the evil eye. The Tamils use Abrus seeds of different colors. The red variety with black eye is the most common, but there are black, white and green varieties as well. In Siddha medicine, the white variety is used to prepare oil that is claimed to be an aphrodisiac. A tea is made from leaves and used to treat fevers, coughs and colds.Seeds are poisonous and therefore are used after mitigation.The plant is also used in Ayurveda. The oil made from the Crab's Eye seed is highly used in Ayurveda because it is said to promote the growth of hairs. It is sometimes used as an ingredient in Indian hair products. Normal soil, Keep the soil uniformly moist but not soggy.